President Donald Trump signed a sweeping executive order on Tuesday aimed at reversing much of former President Barack Obama’s efforts to shrink the United States’ carbon footprint. The long-awaited order instructs the Environmental Protection Agency to review the Clean Power Plan, the Obama administration’s signature policy for slashing greenhouse gas emissions from the utility sector, by far the country’s biggest emitter. This review marks the first step toward scrapping the regulation. 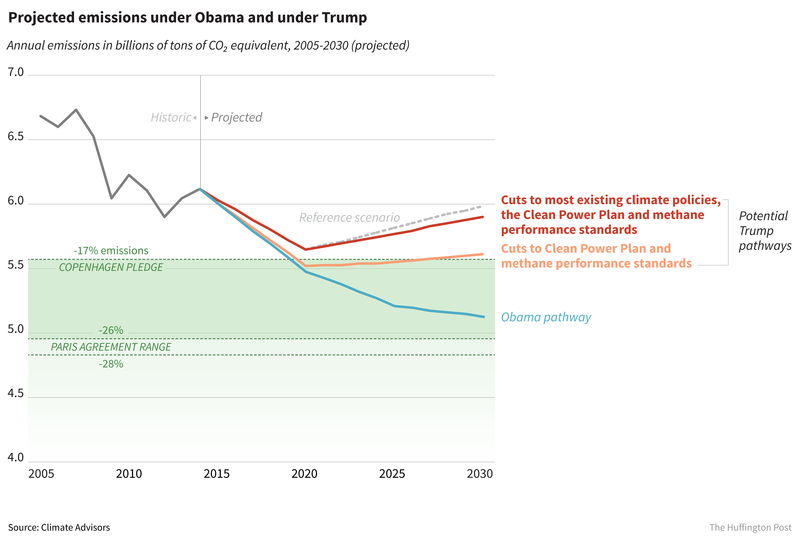 By undoing the Clean Power Plan, the Trump administration is putting projected carbon emissions back on an upward trajectory. It is also abandoning any hope of meeting the U.S. emissions reduction targets set out in 2015 in the 195-country Paris Agreement, the first global climate pact to include China and the U.S., the world’s top polluters. China ratified the Paris climate deal in September. In January, Chinese President Xi Jinping urged the U.S. not to withdraw from the agreement. Trump’s executive order does not contain language critical of the Paris accord, reflecting pressure from Trump’s few advisers who don’t take a hard-line stance against climate science. To be sure, the Trump administration can’t just get rid of the Clean Power Plan outright. In his previous role as Oklahoma’s attorney general, EPA chief Scott Pruitt sued the Obama administration to block the plan, claiming the rule overstepped the EPA’s legal mandate. In a victory for Pruitt and other Republican state attorneys general, the Supreme Court issued a stay on implementing the plan in February 2016. But the high court’s 2007 ruling in Massachusetts v. EPA, which categorized greenhouse gases as a pollutant, legally compels the federal environmental agency to police emissions. “It looks like there’s going to be a reopening of the whole question of the best way, the legal way, to get at the largest source of greenhouse gas pollution in our country, which is the fossil fuel-fired power plants,” Frank Rambo, head of clean energy and air pollution at the nonprofit Southern Environmental Law Center, told The Huffington Post in an interview ahead of the order’s release. Environmentalists are likely to sue to protect the Clean Power Plan, forcing the White House to prove in court that the regulation meets the legal standard of “arbitrary and capricious.” To successfully employ this standard to overturn a previous court ruling, White House attorneys would have to debunk the overwhelming scientific consensus that global warming is man-made. 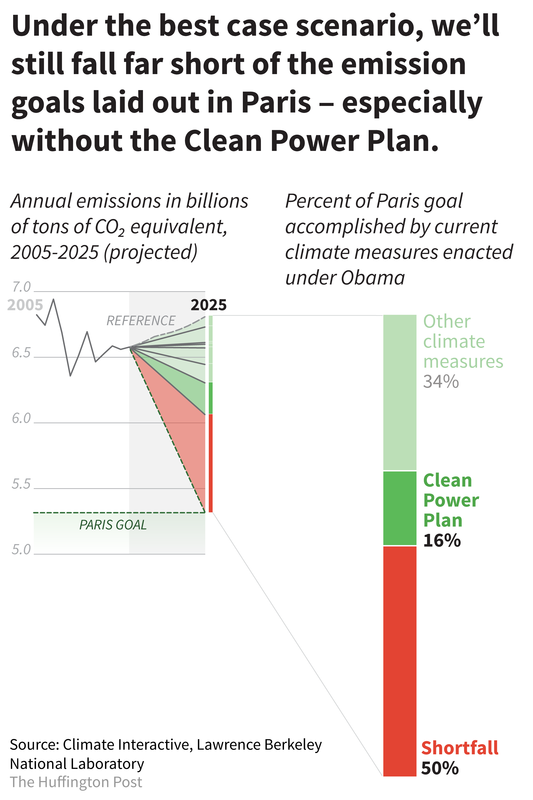 The biggest problem with dismantling the Clean Power Plan is that the plan itself represents only a preliminary step toward reaching emissions reduction goals. 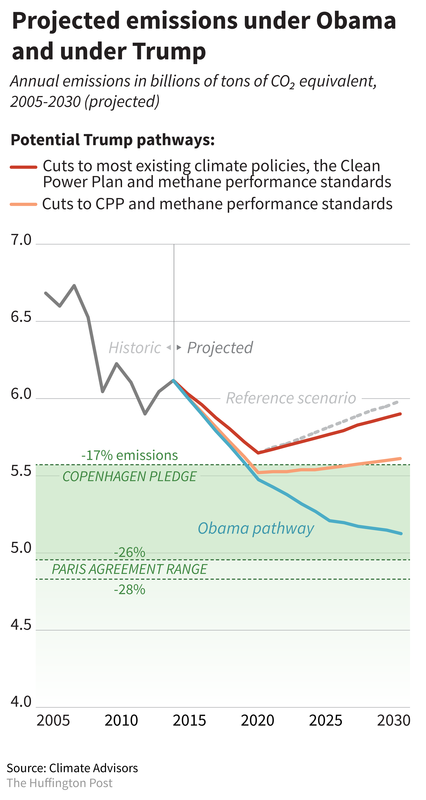 Even if the plan were to be perfectly implemented, the U.S. would still be progressing only halfway toward achieving its emissions goals for 2025. Trump may fail to completely undo the plan, but his administration seems unlikely to enact other policies to reduce emissions. Trump pledged to boost the U.S. economy by gutting environmental regulations he blames for holding back businesses. Earlier this month, he proposed slashing the EPA budget by nearly one-third, eliminating popular programs like Energy Star and hampering the agency’s enforcement division. The EPA already rescinded a rule this month requiring oil and gas drillers to report leaks of methane, a greenhouse gas 40 times more potent than carbon dioxide. Kneecapping U.S. participation in the Paris Agreement could jeopardize the future of the deal itself. The accord, signed in December 2015, set out global emissions targets far below what’s required to prevent world temperatures from surpassing the 3.6-degree Fahrenheit increase that scientists say will irreversibly damage human civilization. The language of the Paris deal urges the United Nations to reconvene every five years to set new, more stringent goals. If a country as wealthy and powerful as the U.S. fails to meet its baseline commitments, it’s unlikely that poor, developing countries that depend on fossil fuels to grow their economies will make ambitious emissions cuts themselves. The failure of previous global deals, such as the 1992 Kyoto Protocol, hinged in large part on the U.S.’s refusal to implement emission cuts. And already, Trump has proposed curtailing payments to the U.N.-administered Green Climate Fund, which helps poorer countries build renewable energy infrastructure and prepare for the effects of climate change.